- about 50 all new and original high quality models for ships and environment. - Custom FrontEnd, mission souvenirs, e-mails, and all the fun stuff outside the missions. The Project is powered by Vince T's X-Wing HQ. Check by the site every now and then to get your hands on the latest models and other addons already available! Finally, the first real Dhilani Capital ship is completed and ready for download! 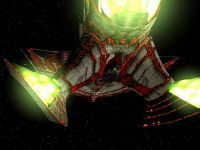 The Dhilani Trident acts as both troop carrier and battleship and is one of the most common ships encountered in Dhilani Invasion fleets. You can get this model for X-Wing Alliance along with some more info and screenshots from HERE! - and maybe drop a Comment! Blue Phantom Project 2005 FAQ Survey! the mod is not dead. C'mon don't die on me! um why isnt anyone updating the profile? Ive been to this mod's site and its been updated a lot recently. General Trageton, u really need to update the screenies here :) Good work anyway this mod looks good! are you going to relase some beta pack or you are going to relase it when its complete?? Well, I'm releasing the ship models whenever they're completed. You can check the news page at my main site. I've noticed on images you have actually planet surfaces so i assume there will be missions on the surface right? just wondering if you will therefore be in corperating some sort of gravity effect? 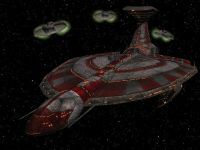 btw love those victory fighters they look amazin, they sorta look like a very very streamlined version of those fighters from battlestar gallactica (vipers i think they were called). good work anyway! cant wait to see finished product.